The Richard Bland College state-owned vehicle use policy mandates compliance with the Department of General Services state-owned vehicle policies. The purpose of this policy is to establish requirements and procedures for ground transportation. This policy applies to the use of any use of College vehicles by employees of the institution for College business or College-related activities. College Business: Actions undertaken by College employees (including faculty and student employees) or volunteers acting within the scope of their employment or authorization. Examples of College business include running errands for a department, attending a meeting off campus, and advisory service trips (in accordance with RBC’s mission). Examples of travel that do not constitute College business include commuting to work or driving to voluntary social events hosted by the College. College-Related Activities: Those events, trips, and activities that are (1) organized by College faculty or staff and required or mandatory elements of the related course, activity, or program, which may include travel for academic research; (2) organized by a recognized student organization and formally approved by a College official; (3) field work as part of sponsored research; or (4) directly funded by the College. Richard Bland College employees must send an email to vehicle@rbc.edu to schedule a vehicle unless a state vehicle has been assigned specifically to one individual person. Exception: Employees must obtain prior written approval from their immediate supervisor to keep a state vehicle parked in their assigned building parking lot. Vehicles must be picked-up one day prior to use between the hours of 3 p.m. and 4 p.m. only. Only facilities personnel will have access to fuel pumps for ALL vehicles whether or not assigned to an individual. An inspection of all vehicles will be made before and after each use by the employee and facilities personnel to ensure the vehicle is returned in the same condition as when signed out. Vehicles will be signed out by the employee along with logging the beginning mileage and ending mileage after each use. Any warning lights or other signs of problems or concerns must be reported when returning the vehicle. Vehicles shall be clean of all trash when returned. Except for extreme situations, all requests for maintenance or repairs to RBC- owned or controlled locations must be submitted by email to office.facilities@rbc.edu. The Department of Capital Assets and Operations (“Facilities”) will respond to work order requests in the order in which they are received (for non-emergencies). Once the work has been completed, an email will for forwarded to notify the requestor of completion of work. If parts need to be ordered for repairs, Facilities will notify requestor. Once parts are received, the work will be completed as soon as possible. The Director of Capital Assets and Operations has the authority and responsibility to alter maintenance or repair priorities when appropriate. This policy details the procedures for requesting maintenance or repairs of RBC-owned or controlled property. This policy applies to all RBC employees seeking maintenance or repairs of RBC owned or controlled property. College facilities are designed and constructed primarily for College functions; therefore, College officials, administrative units, and groups have first priority for their use. Second priority is for College-related organizations. Third priority is for non-College-related organizations. The use of buildings and grounds for commercial purposes without RBC consent and the payment of fees is prohibited. See the Facilities Use Agreement and Fee Schedule. All events and activities must occur in compliance with applicable College policies and rules, such as those relating to alcohol, smoking, weapons, and parking. This purpose of this policy is to set priorities for facilities usage, define scheduling procedures, and establish the College policy for charges associated with scheduled events. This policy applies to the scheduling and conduct of events and activities on College property, including in College facilities. Examples of such events or activities include, but are not limited to, meetings and group activities of student organizations, facility rental for private events, and College activities other than scheduled courses and meetings of academic and administrative employees performing work duties. The College allows the use of some of its facilities and parts of its campus for filming and photography. Filming and photography covered by this policy must be approved by the Office of Auxiliary Enterprises, must occur subject to a written agreement, and generally requires payment of location fees. Everyone involved with filming and photography on property owned, leased, or rented by Richard Bland College must comply with all applicable policies found in the College’s Policy Manual, including but not limited to the Weapons on Campus Policy and the Open Flames Policy. Richard Bland College encourages the appropriate use of the College as a method for professional photographers and videographers to capture the beauty of the grounds and buildings. This policy ensures that the photographers/videographers and their subjects are authorized to be on campus. Non-commercial academic filming and photography, such as activities or projects done by Richard Bland College students or faculty in the context of a course of study. These activities may be subject to student policies, including the Use of Campus Facilities. Filming and photography by non-Richard Bland College students or faculty are covered by this policy, even if academic in nature. Casual, unobtrusive filming and photography for personal (non-commercial) use only, such as a tourist taking photographs or home videos. News filming and photography, which is coordinated by the Communications Department at 804-862-6100 x6214 or 804-347-3321 / jwilliams@rbc.edu. Filming: the capturing of moving or still images of Richard Bland College property by any means on any media now known or that may be invented in the future including, but not limited to, film, videotape, digital disk, or any electronic transmission to another medium or to the Internet. A. Prior Approval Required – Making Requests. The filming request and script should be submitted no fewer than 15 business days in advance of the desired shooting dates. Allow a minimum of two full weeks for review of the request. Additional time may be required for script review. Photography requests require 72-hours advance notice. Before a shoot is confirmed, the production company must decide on specific dates and locations. Projects regarded as educational or documentary in nature receive priority, but Richard Bland College reviews all proposed projects in detail to determine if they are compatible with the College’s mission and purpose and other scheduled College activities. Confirmation is also dependent on the consent of the RBC official responsible for each desired location, availability of parking space and security or police personnel, and the schedule of College events. C. Location Fees and Contractual Requirements. Location fees apply for filming and photography at Richard Bland College. See the current permit and fees sheet. A shoot date will be considered confirmed when a contract is signed and a permit has been issued. This must occur a minimum of three (3) business days prior to the filming date. D. Additional and Special Requirements; Exceptions. Projects identifying the grounds as that of Richard Bland College of William & Mary and/or including words, names, symbols, or imagery associated with RBC require additional approval. Certain requirements of this policy may be waived for specific projects at the sole discretion of the College. The College requires authorization to perform any professional portrait photography and/or video services on the campus grounds. Permit requests must be submitted a minimum of 72 hours in advance of a photography session date. Portrait sessions may be booked online via the online form. Commercial Shoot – professional photography for graduation, wedding, engagement, homecoming, family sessions, or other portrait photos ($30 per two-hour session). Commercial Photography Annual Pass – Available for professional photographers: allows unlimited bookings for 1 calendar year. Individual booking dates must be scheduled through the Office of Auxiliary Enterprises at events@rbc.edu ($300). No weekend sessions booked from April-October. Limited weekend sessions available November-March, which must be booked no more than one month in advance. Richard Bland College will adhere to state laws and policies that ban smoking in public higher education facilities and state vehicles, and establish limitations on outdoor smoking. Richard Bland College is committed to providing a safe, healthful, and pleasant learning and working environment for RBC students, faculty, staff, and visitors. The purpose of this policy is to address the use of all tobacco products and electronic cigarettes as well as ensure compliance with the Virginia Indoor Clean Air Act and Virginia Executive Order 41, by providing a healthful and safe environment for faculty, staff, students, and visitors and to preserve the right of choice regarding smoking. All vehicles owned, leased, or rented by the College. All other property owned, leased, or controlled by the College, such as the campus grounds, sidewalks, malls, etc. All members of the campus community as well as contractors and visitors. Smoking: The carrying or holding of any lighted pipe, cigar, cigarette, or smoking equipment of any kind or the lighting or inhaling or exhaling of smoke from a pipe, cigar, or cigarette of any kind. College Facilities: All buildings owned, rented, or leased by the college including residence halls, leased housing, and student activity buildings. The College seeks to promote the health of the college community through the following regulations pertaining to smoking. Smoking is prohibited in all buildings, facilities, and enclosed structures owned, leased, or rented by the College. Smoking is prohibited in all College owned, leased, or rented vehicles. Smoking within 25 feet of a campus building is prohibited. Smokers are required to dispose of their smoking material waste and shall not litter on state-owned property with smoking material waste. Smoking locations must not impede traffic flow in or out of buildings and shall be in a location where smoke cannot drift into office, class, or living spaces. Faculty, staff, student, and visitor smokers are required to comply with all policies and procedures relating to smoking found herein and in the RBC Student Handbook. Anyone inviting a smoker onto campus must advise the visitor regarding the smoking policies. The use of electronic cigarettes (e-cigs), also known as vaping, shall follow the same policies as the use of all tobacco products. In addition to the enforcement mechanism set forth in the Virginia Indoor Clean Air Act, cases involving students who have violated the Policy will be handled through the Student Disciplinary Policy detailed in the Student Handbook. 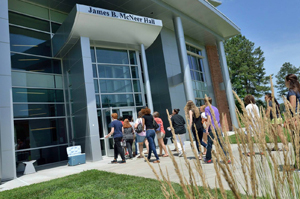 Richard Bland College supports the integration of sustainability throughout campus operations. Members of the campus community are expected to follow the guidelines established in this policy for operating the College in a sustainable manner in order to meet the goals of the Presidents’ Climate Commitment. The College will work to promote (A) Sustainable Purchasing, (B) Green Cleaning, (C) Sustainable Transportation, (D) Solid Waste Management and Recycling, (E) Green Building, (F) Energy Conservation, and (G) Sustainable Landscaping. The purpose of this policy is to support operational efficiency and sustainable practices throughout the operations of Richard Bland College. This policy applies to all facilities and grounds at Richard Bland College and College-affiliated organizations, to all employees and students, and to all campus departments. Sections of this policy may apply to particular individuals and departments as outlined below. Construction and Demolition Debris: This includes waste and recyclables generated from construction and from the renovation, demolition, or deconstruction of preexisting structures. It does not include land-clearing debris, such as soil, vegetation, and rocks. Green Building Principles: The efficient management of energy and water resources, management of material resources and waste, protection of environmental quality, protection of occupant health and indoor environmental quality, reinforcement of natural systems, and integrating the design approach. Green Cleaning: Green cleaning is the use of cleaning products and practices that have less harmful environmental and health impacts than conventional products and practices. Leadership in Energy and Environmental Design (LEED): A third-party green building certification program administered by the U.S. Green Building Council (USGBC). Presidents’ Climate Commitment: The American College and University Presidents’ Climate Commitment is a pledge made by presidents of campuses throughout the country to reduce and eventually eliminate greenhouse gas emissions associated with energy use, commuting, air travel, and other sources. This section applies to all departmental purchases made by Richard Bland College. Sustainable Purchasing Guidelines: Richard Bland College will strive to purchase products that promote sustainability. Preference will be given for products that are reused or contain recycled content; are durable, repairable, or recyclable; have low toxicity; have minimal packaging; come from local sources; have environmentally and socially responsible production processes; and are energy efficient. Preference will be given for working with local businesses and historically underrepresented businesses whenever possible. Paper: Office paper for printing and copying must contain 30% minimum recycled content paper whenever possible. Electronic Equipment and Appliances: Electronic equipment and appliances must be Energy Star labeled for equipment that is eligible for an Energy Star label. Electronic equipment should also meet the standard for Electronic Product Environmental Assessment Tool (EPEAT) Silver or Gold rating whenever possible. This section applies to all facilities and all staff. Preference for Green Cleaning Products: Richard Bland College shall implement sustainable cleaning procedures and sustainable cleaning purchasing practices whenever possible. Preference will be given to purchasing cleaning products that meet Green Seal, EcoLogo, or the Environmental Protection Agency’s Comprehensive Procurement Guidelines. The Department of Capital Assets and Operations must track cleaning product purchases to indicate whether products meet these criteria. Green Cleaning Training: All custodial staff will be trained on green cleaning procedures and the relevant contents of the Sustainability Policy. The training will include information on how to use cleaning products and cleaning equipment, proper cleaning procedures (including application and disposal), and the environmental and health issues associated with cleaning products and equipment. This section applies to all employees and departments at Richard Bland College. Idling Reduction: No vehicle on campus may idle for more than 5 consecutive minutes. Each driver will be responsible for ensuring that the vehicle he or she is operating does not idle unnecessarily. Vehicles should be turned off when parked and should not be restarted until loading or unloading is complete and the vehicle is ready to depart. Vehicle Operation: College employees should drive College-owned vehicles in a manner that maximizes fuel efficiency by observing speed limits, minimizing idling, and minimizing rapid acceleration and braking. Minimize Vehicle Miles Traveled: Alternate meeting methods, such as conference calls, or other technology, should be used when feasible to reduce the number of driving trips. Meetings should be held at centralized locations, when possible, to reduce distances traveled. Where applicable and reasonable, employees should use alternative modes of transportation, such as public transit, walking, biking, and carpooling. In general, travel routes should be planned to optimize efficiency. When feasible, trips should be chained together to reduce required travel time and distance. Maximize Efficiency Through Maintenance: Regularly scheduled preventive and other maintenance shall be performed promptly on all fleet items to maximize fuel efficiency and minimize emissions. Optimize Fleet Size: Vehicles that are used infrequently should be considered for removal from the fleet. Vehicle share agreements among departments, community car-share programs, or vehicle lease contracts should be explored to reduce the number of fleet vehicles needed. Departments should identify the most fuel-efficient vehicles with maximum emission reduction available that meet the department’s operational needs whenever possible. Vehicles of a smaller class size and vehicles such as NEVs (neighborhood electric vehicles) and bicycles should be considered to achieve increased miles per gallon and lower emissions. Preference will be given to purchasing electric, hybrid or alternative/renewable-fueled vehicles and equipment when (A) they meet the operational needs of the Department, (B) their fuels and relevant parts are available or could easily be made available, and (C) they show a reduction in or equivalent emissions or life-cycle per-mile costs (including maintenance), when compared with similar gas or diesel vehicles. “Clean” fuels (such as electricity, biodiesel, compressed natural gas, ethanol, and others) shall be used when feasible. All passenger vehicles acquired will be selected based on minimum GHG emissions and maximum fuel efficiency. Vehicles that achieve a combined 30 mpg or greater will be given preference. Work trucks, cargo vans, and special purpose and emergency response vehicles and equipment shall be purchased or leased to comply with the requirements of this policy whenever possible. The most fuel efficient vehicles that will meet departmental needs shall be purchased whenever possible. Sustainable Campus Transportation: Richard Bland College will encourage employees, students, and visitors to utilize alternative transportation options in order to reduce commuting emissions. Educational programs, incentives, and infrastructure improvements will be explored in order to promote alternative transportation such as walking, biking, public transportation, carpooling, and alternative fueled vehicles. This section applies to all campus facilities and all students and employees at Richard Bland College. The entire campus community is expected to actively participate in Richard Bland College’s recycling program and waste reduction efforts through source reduction, reuse of materials, and recycling. This includes following the provisions of Richard Bland County’s mandatory recycling law. Source Reduction: All members of the college community are responsible for implementing operational practices that prevent waste from being produced whenever possible. Examples include printing reports and documents on both sides of paper; reducing the number of documents printed when possible; using email rather than printed correspondence; and using products that are reusable, refillable, repairable, non-toxic, and recyclable. Items requiring the least possible packaging should be purchased when practical. Every effort should be made to prevent excess or unneeded materials from being purchased. All members of the campus community should identify additional waste reduction opportunities within their units. Reuse of Materials: All members of the college community are responsible for reusing products whenever possible. Examples include obtaining office furniture from the College department of central stores; sharing office supplies when feasible; and using mugs, dishes, glasses, and reusable flatware rather than disposable paper and plastic ware. All members of the campus community should identify additional reuse opportunities within their units. Recycling: All members of the college community are responsible for separating identified recyclable materials and placing them in appropriate recycling containers. Recyclable materials include all items listed by the Richard Bland County Resource Recovery Agency such as office paper, mixed paper, newspapers, magazines, catalogues, craft paper, corrugated cardboard, paperboard, glass, metal, plastics, and beverage cartons. Additional ongoing consumables, such as toner cartridges, will be recycled to the maximum extent possible. Batteries and mercury containing light bulbs will be recycled to the maximum extent possible. Durable goods will be recycled, donated, or otherwise diverted from disposal to the maximum extent possible. Composting Food Waste: Pre-consumer food waste from dining services will be collected for composting using the appropriate containers. Dining services staff is responsible for separating food waste and placing it into the appropriate containers. Additional opportunities for composting will be explored in order to further reduce food waste entering the waste stream. Implementation: The Department of Capital Assets and Operations is responsible for providing recycling bins throughout campus to facilitate recycling; managing the collection of recyclables including training custodial and grounds staff regarding proper recycling collection; and tracking recycling and trash volume. The Department of Capital Assets and Operations is also responsible for identifying additional opportunities to reduce waste and implementing programs and practices to reduce waste. The Department of Capital Assets and Operations is responsible for educating campus community members about recycling and waste reduction through signage, events, and other methods. The Department of Capital Assets and Operations, with guidance from the Director of Sustainability, is responsible for coordinating periodic waste stream audits to determine waste diversion rates. This section applies to all facilities at Richard Bland College and College-affiliated organizations. Achieve LEED Silver Certification for Building Construction and Renovations: All new construction of buildings must meet LEED silver standards. All major renovations of buildings over 5,000 square feet must meet LEED silver standards when reasonably practicable. Utilize Energy Efficient Equipment: For new construction and building renovations, all appliances, heating and/or air conditioning equipment, or other systems that use energy shall be Energy Star qualified, if Energy Star equipment is available. When equipment needs to be replaced in existing buildings due to maintenance, Energy Star qualified equipment shall be used, if Energy Star equipment is available. The Department of Capital Assets and Operations will identify and implement additional energy efficiency improvements and other sustainability measures throughout campus facilities. Monitor Building Energy Consumption: All new and existing buildings shall monitor ongoing energy use with the EPA Building Portfolio Manager or equivalent energy monitoring software. This will allow the College to monitor energy usage, identify potential energy saving opportunities, and benchmark buildings against similar buildings throughout the country. Divert Construction and Demolition Debris from Disposal: At least 50% of waste tonnage from construction, demolition, and renovation projects shall be diverted from disposal whenever possible. The Department of Capital Assets and Operations should work with contractors and waste haulers to ensure construction and demolition debris is recycled whenever possible. Implementation: Project managers will ensure that the strategies specified in the Sustainability Policy are communicated to design and construction firms in the bidding process. Project managers will consider the green building competency of the firms in determining the contractors to hire. Project managers will ensure that the project specifications incorporate the strategies outlined in the Sustainability Policy and that the strategies are implemented throughout each project. Project managers and building maintenance personnel will ensure that energy efficient equipment, such as Energy Star qualified products, is utilized for new construction, renovations, and routine equipment replacement. This section applies to all facilities at Richard Bland College and all employees. cooled to a target temperature of 74° F in centrally air conditioned spaces during the summer. These will be set by the Department of Capital Assets and Operations in centrally controlled systems. Occupants who control their own thermostats are required to adhere to these settings. Temperatures may fluctuate within the building around these set points and every effort will be made to stay within 2° F of this range. Supplemental electric heaters shall only be issued in the case of long-term system malfunctions and as authorized and provided by the Department of Capital Assets and Operations. No other use of electric heaters is allowed and unauthorized heaters will be removed. Turn off lights when exiting rooms that are no longer occupied. Turn off office equipment (including monitors, task lights, personal computers, and other equipment where possible) when leaving a workspace for more than 30 minutes and at the end of the day. Set computer power management settings so that computer monitors turn off and CPU enters hibernate or standby mode after extended periods of time. Enable power management features on laser printers and copiers and power them down whenever possible, particularly on evenings and weekends. Utilize Energy Star equipment whenever possible. The Department of Capital Assets and Operations shall identify and implement additional energy conservation opportunities throughout campus facilities. This section applies to all campus grounds and the Department of Capital Assets and Operations. Sustainable Landscaping Guidelines: Richard Bland College shall manage campus grounds and landscaping in a sustainable manner, shall implement the Sustainable Landscape Master Plan to the fullest extent possible, shall utilize the Environmental Protection Agency’s four-tiered approached to Integrated Pest Management for all campus grounds whenever possible, and shall utilize native plants for landscaping on campus whenever possible.